Jingle All The Way – Last Friday I patrolled the CD aisles at my local Super Walmart and found: Jingle All The Way (Original Motion Picture Soundtrack). I bought it for a very decent price of $5 (U.S.). Super Walmart seems to have hundreds of very cool CD’s for sale at the $5 price point. There may even be more than hundreds, there’s that many at this particular location. I never knew this soundtrack existed. Heck, I’m not a Christmas motion picture soundtrack expert! I am an expert at eating Lay’s potato chips lately though and that has to stop. Um, yeah. 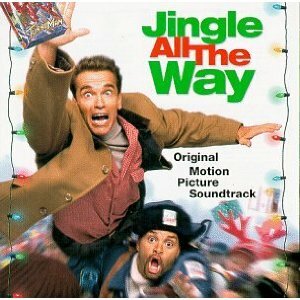 The front cover to this CD shows the two stars of Jingle All The Way: Arnold Schwarzenegger and Sinbad. Both the movie and CD was released back in November of 1996. This CD was released on TVT Soundtrax. This movie, (in case you haven’t seen it), is an action-comedy, released by 20th Century Fox. I’ve always enjoyed catching this movie when it airs on one of the 150,777 cable networks out there. I’ve always appreciated the funny side of “The Governator” too. The dude just makes me laugh when he does comedy. Sinbad is a comedy legend, hands down. The Brian Seitzer Orchestra is featured with 4 songs. The Brian Seitzer Orchestra is very cool in Stone’s world, by the way. Brian Seitzer should be inducted into The Rock And Roll Hall Of Fame too, only we all know how that “institution” goes. Um, yeah. My favorite all-time Christmas song is featured on Jingle All The Way as well: Chuck Berry – Run Rudolph Run. Chuck Berry is an ultra Rock ‘N Roll icon. ‘Nuff said. The ever popular Jingle Bell Rock by Bobby Helms and The Most Wonderful Time Of The Year by Johnny Mathis are among the 12 songs. If I had to count the number of times I’ve heard this Johnny Mathis Christmas classic, while I’ve been shopping during the holiday season, my guesstimate would be: 1,650,444 times. Give or take about 55,000. I still kinda dig the song too. Metal be thy name. If you dig Christmas movie soundtracks, love Christmas songs or need to have every CD that features Sinbad on its front cover, then Jingle All The Way is a semi-mandatory recommendation from Stone. Merry Christmas, Happy Holidays & Happy New Year. CHUCK BERRY – As I was dining today, with the family, at our local Cracker Barrel Country Store and Restaurant, I overheard an all-time favorite Christmas song of mine – Run Rudolph Run, recorded by the ultra legendary Chuck Berry. It’s always a cool thing when a restaurant plays background music that isn’t lame and puts you to tears. While I feasted on some of the best fried chicken, macaroni and cheese and mashed potatoes that Stone could ever ask for, Run Rudolph Run just put me in a fine holiday mood. Kudos to this Cracker Barrel franchise that has a location in the cozy town of Fogelsville, Pennsylvania. Usually the “other” big name franchise restaurants serve you cold food or pricey dinners that taste like they came straight from the microwave. This isn’t the case with Cracker Barrel, just good and tasty food from a menu where you can identify what your ordering. Well, back to Chuck Berry and Run Rudolph Run. Upon my Metal research, I’ve discovered that this classic song was written by Johnny Marks and Marvin Brodie and published by St. Nicholas Music (ASCAP). Chuck Berry made Run Rudolph Run famous, and his vocals to this day can never be copied, nor can anyone seem to come even light years close, in my Metal opinion. Chuck Berry is one of a kind. Apparently, Run Rudolph Run peaked at #69 on The Billboard Hot 100, back in 1958. Gee Metal whiz, I would have thought it charted higher than that! Nonetheless, this terrific Chuck Berry song will forever be a favorite of mine… all year long too. * I did locate which Chuck Berry CD you can find Run Rudolph Run on, it is on Chuck Berry – Rock’n Roll Rarities. (See image at top of post). There are 20 Chuck Berry Rock ‘N’ Roll Classics on this CD, with Run Rudolph Run being track #15. 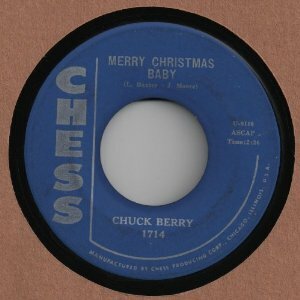 Of course, you don’t have to buy the entire Chuck Berry CD to own this song, Run Rudolph Run is sold as an individual mp3 on most “popular” music store websites. * I’m certain there are scores of other Chuck Berry “Best Of” and other Rock ‘N’ Roll compilation CD’s out there that have Run Rudolph Run included as a song. 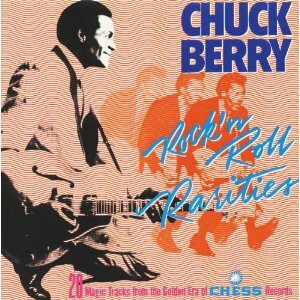 I used this particular Chuck Berry CD as a specific example… plus it really is a solid compilation of his songs, some not so well known too. * Chuck Berry was inducted into The Rock And Roll Hall Of Fame in 1986. LONG LIVE CHUCK BERRY AND HIS ROCK ‘N’ ROLL. CHUCK BERRY… A TRUE ROCK ‘N’ ROLL PIONEER. W.A.S.P. has brought the Chuck Berry 1964 Rock and Roll Classic Promised Land to the Heavy Metal forefront. Promised Land is from the Chuck Berry album from 1964, St. Louis To Liverpool. Appearing on their new studio album Babylon, Promised Land is the last song, closing out a tremendously catchy and hook laden, Old School Heavy Metal album. W.A.S.P.’s Heavy Metal lays down the riffs, leads and solos that resonates power and electrifies this song. The rhythm section of W.A.S.P. sets and maintains the Metal pulse of Promised Land, balancing out a groovy ride. When an early 1960’s Rock and Roll Classic like Promised Land can be covered with the passion and intensity that W.A.S.P. 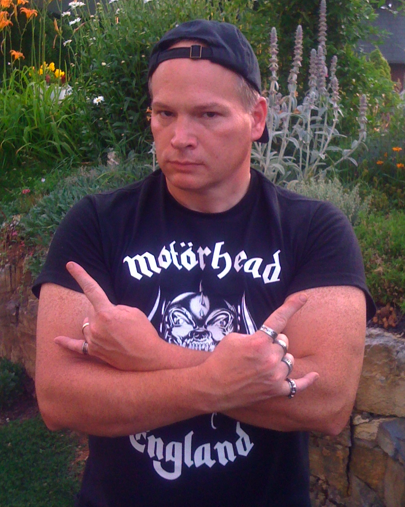 brings, it is the Old School Heavy Metal balance and basics that makes this song come to life. W.A.S.P. makes this song crush with heaviness without sacrificing any early 1960’s Rock guitar sound and energy. Nothing is overdone with W.A.S.P. covering Promised Land. This is not a cover song that is a filler for this Babylon album. I always feel, that if you are going to cover a Rock and Roll Classic, there better be plenty of emotional integrity with the music and vocals combined. A cover song has to really convey the original song’s essence and fire. Blackie Lawless does live up to my expectations with covering Promised Land vocally, he really sings the lyrics as if he penned them himself. Blackie Lawless sings the lyrics of Promised Land as if he truly was the poor boy, (in this song), traveling across the country to California. To camouflage oneself within a song’s lyrics, to make the song sound so believable as Blackie Lawless does with his vocals, is worth taking a bow. In my Metal opinion, listening to Blackie Lawless sing Promised Land makes me believe that he would have owned an enormous crowd of frenzied Rock and Roll fans back in 1964. This same sentiment goes to the entire W.A.S.P. band here, based on how authentic Promised Land plays out on Babylon. W.A.S.P. would have torn the roof down, (literally), at any given theater that catered to Rock and Roll concerts – back in the early 1960’s. Anytime a band of any Rock or Heavy Metal genre pays tribute to such an icon such as Chuck Berry, it makes for quite the Rock and Roll history lesson. Younger bands should take notice, saluting a Rock and Roll originator such as Chuck Berry, through a high quality cover song such as W.A.S.P. 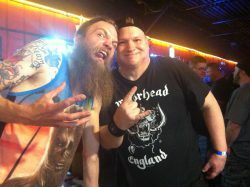 has done, is of the highest compliment to this Rock and Roll legend. This cover version of Promised Land had me hooked from the opening note, it is the Heavy Metal of W.A.S.P. taking over a soda hop from 1964 and bringing it into 2009. W.A.S.P. is not the first band in Rock and Roll history to cover Promised Land. This song is too great for it not to have been previously covered. The late and unreal legendary Elvis Presley covered this song, found on his 1975 album Promised Land. Rock icon The Grateful Dead have covered this song, (it was a staple in their live sets), plus other Rock luminaries such as Meat Loaf, James Taylor and Dave Edmunds have covered Promised Land on album too.